Nancy French target shooting from her front porch. We're home for the holidays today and we released our Good/Bad/No panel from their duties. But we thought we'd check in with a few of our regulars to see how they're spending the weekend. Nancy French is the author of Red State of Mind: How a Catfish Queen Reject Became a Liberty Belle. 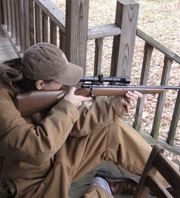 She reports live from target practice on the front porch of her parents' home in Paris, Tenn.
Hi, Nancy -- Very refreshing to us "elitist" shooters (Kimber Custom Target II, Ruger MK II, for Bulls-eye target) to listen to your interview. By, hey! How about some eye and ear protection? Happy Thanksgiving!